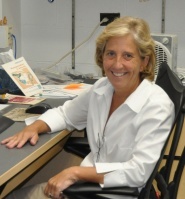 Home Faculty Karyn Esser, Ph.D.
Skeletal muscle is the largest organ system in the body and is well known to be important for human health through its contribution to breathing and mobility and through its metabolic role as the primary site of sugar storage and fat metabolism. Recent studies, however, have provided evidence that maintaining healthy muscle can increase longevity and can improve outcomes in chronic diseases such as cancer. My lab has pioneered research on the role of circadian rhythms and the molecular clock mechanism in skeletal muscle homeostasis and health. Using genetic mouse models, we found that mutations of two different molecular clock genes, Clock and Bmal1, dramatically disrupt skeletal muscle structure and function. Parallel with our work on the molecular clock in skeletal muscle we are also pursuing the role of physical activity/exercise as a time cue for skeletal muscle and other tissues. We have also shown that time of exercise can significantly alter the clock mechanism in skeletal muscle independent of lighting and the central clock in the brain. Our research goals are to define the transcriptional networks and downstream mechanisms that link the molecular clock with proper skeletal muscle function and phenotype. Additionally we are working in mouse and human models to determine the potential for time of day lifestyle interventions as a therapeutic approach to enhance molecular clock function and attenuate conditions of muscle weakness and wasting seen with aging and chronic diseases. Lance Riley: Young Investigator Award, Talk on “The Muscle Clock Regulates Titin Splicing and Sarcomere Length”.